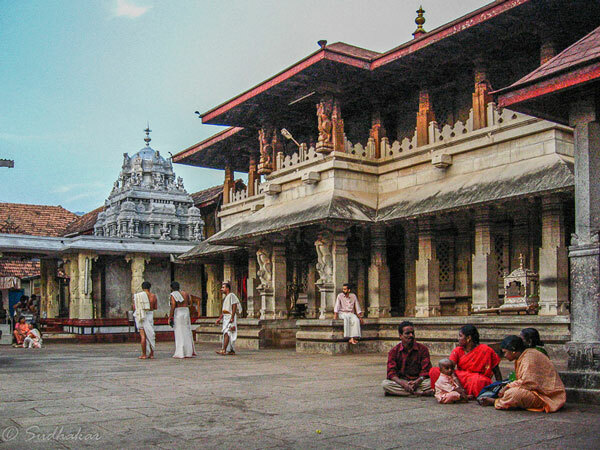 Mookambika temple is an ancient temple dedicated to mother Sakthi located at Kollur in Karnataka, about 75 kms away from Udupi.She is worshipped as Maha Kali in the morning, Maha Lakshmi in the noon and Saraswati in the evening. It is believed that Sri Adi Shankara himself installed the idol of deity in the temple some 1200 years ago. As per mythology there lived a demon named Kaumasura, who unleashed terror upon the gods by the special powers he got from Lord Brahma. When Kaumasura realised that his life is about to end soon , he undertook a severe penance. Before Lord Shiva could appear to grant im the boon, Goddess Saraswati,made him dumb so he could not speak. Kaumasura came to be known as Mookasura (or the mute demon). Goddess Lakshmi killed the demon, and hence she came to be known as Mookambika,the slayer of Mookasura. She is worshipped as Maha Kali in the morning, Maha Lakshmi in the noon and Saraswati in the evening. It is believed that Sri Adi Shankara himself installed the idol of deity in the temple some 1200 years ago.As per legends , Adi Shankara goddess lakshmi appeared before Shankara in response to his prayers and asker him his wishes. Sankara wanted her to come along with him to Kerala, where no temple was dedicated to her at that time. Goddess Lakshmi agreed to go with him on the condition that Shankara must lead the way not looking back to check if she was with him. Should Sankara break the condition, she would stop and stay right where she was at the time. Sankara agreed to the condition. So they started walking down the Kodachadri hills, with Shankara leading the way and the goddess’ anklets making sounds to know that she was with him. After walking some distance, the sounds of the anklets stopped and Sankara instincly looked backwards to see if she was still following him. As per the condition, the goddess stopped right there and wanted to stay in Kollur. Sankara apologized profusely for breaking the condition and pleaded with Lakshmi to go with him to Kerala. Pleased with Sankara's determination and devotion, Lakshmi agreed to be present at the Chottanikkara Temple in Kerala in the mornings and return to the Mookambika temple by mid day. 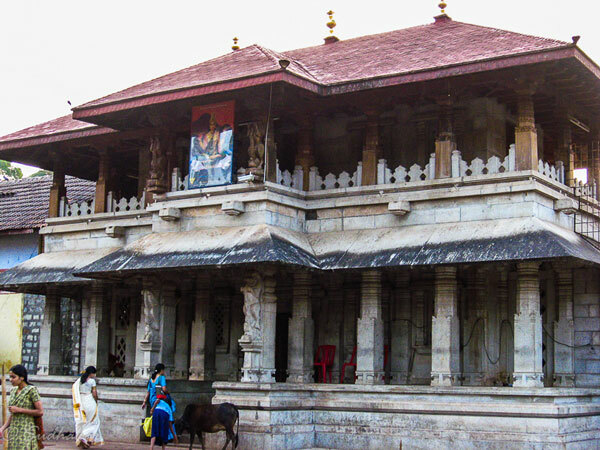 The temple is located in very picturesque surroundings on the banks of the river Sauparnika (said to possess medicinal properties) at the foot of the Kudashadri hills.The temple is style resembles the Kerala style of architecture. The swayambhu lingam considered to be a Shiva and Shakti manifestation in front of the deity is said to have been installed by Adi Sankara. This Lingam has a golden line approximately at the center that divides this lingam into two unequal parts and is visible only in the if a light is reflected at the lingam. The right portion of this lingam is said to represent Brahma, Vishnu and Shiva and the larger left part Lakshmi, Saraswathi and Parvathi . It is a belief that the three goddess Lakshmi, Saraswathi, Parvathi and the three lords Brahma, Vishnu and Maheshwara emerged out of it. The panchaloka idol of Mookambika is also said to have been installed by Adi Sankara and She is seen sitting in padmaasana posture holding a Sangu (Conch) and a Chakra (discus) in her upper hands and while showing Abhaya and Varada mudras in Her other hands. The idol of Mookambika is adorned with exquisite gold and diamond jewelry. 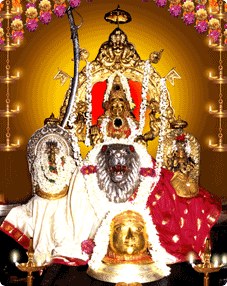 On either side of the Mookambika Devi are the idols of Goddess Kali and Saraswathi. The beautiful ornamented sword placed near the Mookambika was gifted by the former Chief Minister of Tamil Nadu, Mr M.G.Ramachandran. In the outer prharam around the sanctum, there are smaller sannidhis for Lord Vinayaka who is seen with 10 hands, Subramanya, Hanuman, Veerabhadra and Adi Sankara.It is customary here that Veerabhadra is worshipped first by devotees before entering the sannidhi of Mookambika. 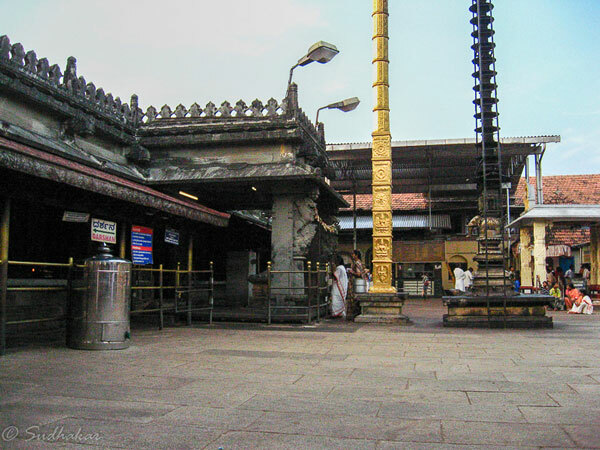 There is a room near the sanctum that has the 'Sankara Simhasanam' which is regarded as the very spot where Adi Sankara sat and meditated and had the darshan of Mookambika.Adi Sankara is said to have composed the Soundarya Lahiri here. A huge tall deepasthambam with its base like a tortoise’s head is seen in front of the sanctum. This deepasthambam has 21 beautiful concentric circles which appear very divine and beautiful to watch when all the lamps are lit. Faiths & Beleifs During the last sevarthi at 9pm everyday, a concotation of herbs known as 'Kashayam' is distributed as prasad. Consuming this is beleived to cure the devotees' ailments and consiered as an elixir. Festivals Navarathri (the nine day festival) here is considered to be the most auspicious time to offer prayers to goddess Shakthi and Her other forms. 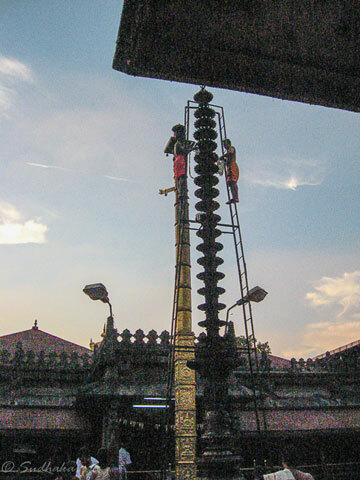 Millions of pilgrims visit the temple on these nine days.Mahanavami falls on the ninth day and it is considered to be the most important day among all other days of the Navarathri.On this day Maha Chandika Yagam and pushparathothsavam (temple car decoarated in flowers)are performed. During the procession of the deity, coins are thrown from the Pushparatham and those devotees who happen to get these coins are said to have the divine blessings of Sri Mookambikai. The tenth day of the Navarathiri is Vijayadashami and is an auspicious day for children to start their education called Vidya Arambam.Pilgrims throng the temple from 4 am onwards for akshara abhishekam. Temple LocationThe temple is located at the heart of this small town. How to Reach Udupi is well connected by road and the Mangalore airport is around 60 kms from Udupi. From Udupi you can get plenty of state owned buses and private buses to Kollur. You can also hire a cab to Kollur. Where to Stay There are a few modest to semi luxury hotels here in Kollur. Do not plan your stay at Kollur during Navarathri, and other holidays without confirmed room reservations. Where to eat?There are a few eateries which will be a liitle above average only. Other interesting places around Kodachadri hills: Adi Shankara is said to have visited this place, meditated here and he also established the temple at Kollur. A small temple called Sarvajnapeetha, built with stone is dedicated to Adi Shankara at the top of Kodachadri. It was here that Adi Sankara is said to have asked Lakshmi to accompany her to Kerala. Best Season: Throughout the year. June to September are the period of monsoon, accompanied by heavy winds in southwest and northeast directions. Altitude: Around 80 metres above MSL.